I have been crushing books recently. But before we jump into that, let me provide a little background. Why Do I Keep Track of Books Read? Flashback to 2008 … Michael Phelps won in the most exciting finish ever, Barack Obama became president, and I graduated from college. There is an incredible jump in freedom when 18 year-olds go off to college – no parents, no curfew, and easy access to your choice of poison. It crushes some people while others learn to thrive in the new environment. There is also an incredible jump in freedom when 22 year-olds graduate into the working world – no grades, more structured free time, and money to spend. It crushes some people while others learn to thrive in the new environment. After a couple months of adjusting, I started creating the changes I wanted to embrace in this new period of life. The largest was becoming vegetarian after a self-imposed two month vegan challenge. But the one relevant to this post is keeping track of the books I read. I learned about the field of personal informatics – tracking specific data from your life to keep as a record or use for optimization (I blogged about it here). I ultimately decided tracking too much data is OCD and to be avoided. So I would only track data for short term optimizations and one long term record – the books I have read. This is important to me as a history of what I was interested in at various points of my life and so I have a list to refer back to when giving book recommendations. Why Do I Make My Book List Public? I find it very interesting to learn what smart people are reading (this mainly means non-fiction, since smart people become smart from a thirst for knowledge, and books are quite possibly the best way to explore an idea in depth). It successfully communicates the influences upon that person in a way that has yet to be beat. 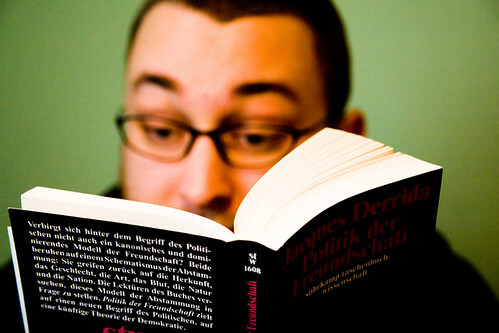 I also look to see if the person reads across many disciplines and seeks out viewpoints that contradict from their own. Since I pretend to be one of these smart people, I will keep my book list public. For the last three and a half years I have finished roughly 1.5 books per month. There were periods of learning about investing, behavioral economics, startups, and more. But then there is a period of 6 months in 2011 where I did not finish a single book. With hindsight, this is a red flag signaling something is off – what was happening in my life to put an abrupt end to my thirst for knowledge? First, I was struggling in a job going nowhere which stunted my intellectual curiosity. Second, my spare time was used to create Breakout Mentors to provide fun computer programming lessons to 10-15 year-olds. Then I retired from the working life and have finished 13 books in the 4-5 months since (and going to finish 3 more in the next week). In my relaxed state I have branched out and tried new things: the Hunger Game series, 2 biology books from Tom’s New Zealand science collection, and a classic 1000 pager I have put off for many years. It has been great and I hope to sustain this pace upon my return to the States. Who is with me – are you going to start keeping a book list if you aren’t already? Have you drawn any interesting insights looking back on your list? Web article reading lists are also good but less common and shorter works aren’t as influential as books – check out uber-blogger Ramit Sethi’s delicious psychology tags for some good reads. Dedicated reader B.Lindy has requested notes or ratings of the books so that he can better use the list as recommendations. Good idea, but not yet implemented (Derek Sivers’ list is what I aspire to have some day). Anyone interested can drop a comment about specific books or what they are interested in and I’ll try to help. You should tots do it! You should Preston! I did a test month and I already love how it’s going to turn out. And it will be really fun to look back on my year… It was hard to adjust to remember to do it every day but I’m sure it will become second nature after awhile. Brian, have you finished Atlas Shrugged? Let’s watch the movie when you get back. I’m curious to see how they did it but I don’t think it will do the book justice. Yes, I finished Atlas Shrugged. It was awesome. I was interested in the movie until I learned that they split it up into 3 parts – so the movie that came out is just the first third. And it flopped and got horrible reviews. There aren’t exactly plenty of climaxes to make it acceptable to split into separate movies. Thanks for the shoutout. Though I can’t believe, in all of our discussions, we didn’t make it to the value of fiction for understanding the world. You need to get your Russian Lit on! That being said, my love of fiction is mainly theoretical. When push comes to shove, I’m on to the next biology book. Sounds like I need to hear your thoughts about Russian Lit. Want to come up to Raglan? Skinner you gotta do goodreads.com. It makes this process so much easier. Will you be my reading buddy? I think there is a lot of knowledge and enjoyment to be gained from reading fiction as well as nonfiction. You’re missing out if you confine yourself to real people and real facts all day long. I also really like the 1 second video idea. I want to try though I would be shocked if I kept with it for any real length of time. goodreads.com helps with which part of the process? I’m also not necessarily into easier – facebook is an easier way of communicating with you, but I def prefer this. I like goodreads for tracking what I’m reading, what I want to read, what I thought about what I have read. For those of us without a blog we can still post and share our thoughts.